The 6080A and 6082A give you exceptional spectral purity. Phase noise at 1 GHz is -131 dBc/Hz at 20 kHz offset. Non-harmonic spurious per-formance is -100 dBc at 1 GHz. 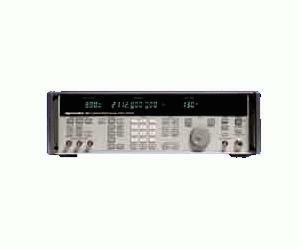 And residual FM is a low 1.5 Hz, which is ideal for both high performance receiver test and LO substitution. The output level of +19 dBm (+20 dBm with overranging) gives you all the power you need for receiver overload tests, LO bstitution, and for driving high level mixers. AM, FM, phase and pulse modulation are all available, and can be combined for complex signal simulation.